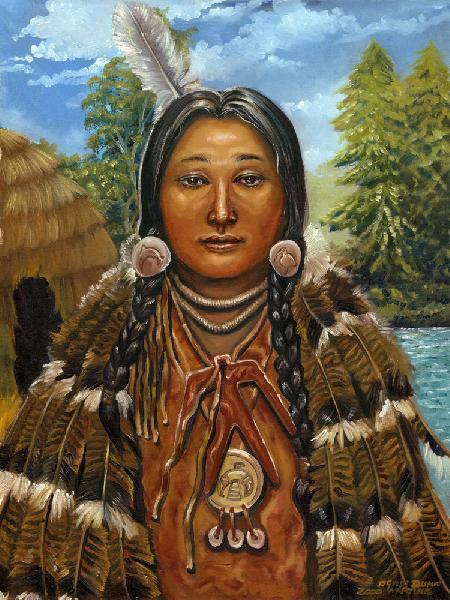 This is a picture of a young Shinnecock girl who is wearing a cape or mantle of wild turkey feathers. This was a common Native American garment used by the Shinnecock (Algonquian tribe of Eastern Long Island) during the 17th and 18th centuries. In the background is a wigwam or wickiup, the traditional dome-shaped dwelling of the Shinnecock people. Old Fishing Shack - Southampton, N.Y.